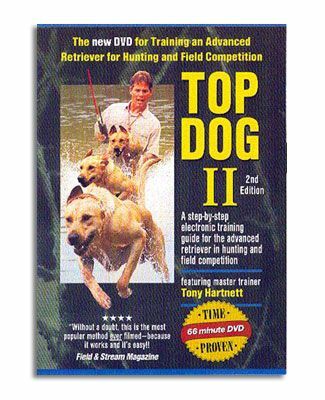 Take your hunting retriever to the top with Top Dog II! Starting where the “Top Dog” DVD leaves off, learn these simple techniques, some of which have never been seen before on video. Using the revolutionary electronic collar, you will have an advanced retriever in hunting and winning field competitions! Learn how to run precision 250 yard blinds, how to avoid poison birds, how to honor, how to take “thread the needle” lines and many more time-proven techniques with this dog training DVD. 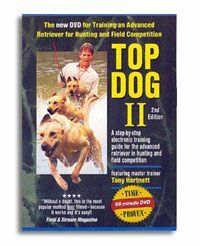 Combining the proven methods of Richard A. Wolters with the newest techniques of Tony Hartnett, the Top Dog II dog training DVD takes your retriever to new heights! From the producers of the best selling DVDs “Water Dog,” “Game Dog” and “Top Dog” hunters, hunt testers and field trialers can finally take the confusion out of advanced retriever training!! Top Dog II picks up where its predecessor, Top Dog, leaves off, providing advanced information on training retrievers to their highest level of ability. As does Top Dog, this dog training DVD stresses the use of the electric collar as a reinforcement device to improve the skills a retriever has already learned. The Top Dog II training regimen builds on the basic drills taught in Water Dog and Game Dog, which teach retriever training without the use of an electric collar, but Top Dog II also includes more complex drills, including angle entries, multiple blinds, honoring, and much more. Trainers employing lessons taught in Top Dog II cannot only help build a dog’s confidence, they can also teach it to realize its maximum potential as a finished retriever.